Under increasing competition in the automotive industry, new car replacement cycle has become shorter. Many years ago, a car need not to be updated for long, but now it could easily be eliminated if you do not develop new car, therefore,In the R&D process, Its inevitable and ultimately to make Auto Parts Prototype. By doing auto parts prototype, not only to verify the accuracy of vowin.cn' target='_blank'>product design, to see whether the product is consistent with the design, to reduce the product assembly difficulty and adjust the drawing, but also reducing the risk of direct open vowin.cn/' target='_blank'>mold. Especially when developing the expensive product like a car, it can cause incalculable damage when there is a problem during mass production. Shenzhen TUOWEI Prototype is a professional prototype maker for Centre Panel Shell Prototyping for over 14 years, the maximum processing size of the CNC machine is 1800 * 700 * 250 to meet the different needs of industrial manufacturing customers. In addition, the company has 28 CNC machining equipment (Including two sets of automatic tool transfer function) and 2D/3Dimensions coordinate measuring machine and other sophisticated detection equipment, the quality and schedule of shipments are always met with the specified time. There are alwyas new client who are looking for auto parts supplier through internet including Foxconn, Nikon, BYD-as well known car brand in China. 1 programming. Programming is the first step in the prototype process, the programmer will analyze the 3D product data from the numerically controlled machining centers be written in a programming language. 2, CNC machining. The programming language is entered into a computer which, for accurate machining command program. 3, Hand Polishing: use sandpaper to grind the workpiece to held appearance or rub the workpiece looks smooth and fine enough. 4. Final Painting: Use the Paint gun and other stuff to spray paint flakes after atomized spray on the workpiece to be coated. 5, Screen Printing: through the process of extrusion blade, the ink can be printed through the mesh process from Screen transferred to the workpiece, to meet with the original logo/contents demand. 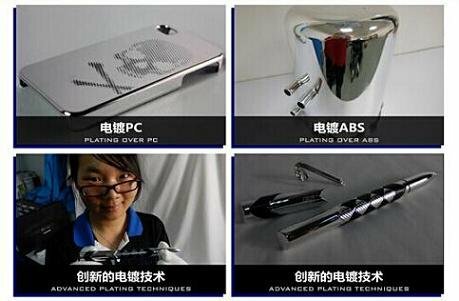 6, Chrome plating: is a finishing treatment using the electrolytic deposition of chromium. The most common form of chrome plating is the thin, decorative bright chrome, which is typically a 10-µm layer over an underlying nickel plate. 7, Laser Etching: Using lasers to engrave an object with pattern on the surface by removing the paint at specific position. The technique does not involve the use of inks, nor does it involve tool bits which contact the engraving surface and wear out. These properties distinguish laser engraving from alternative engraving or marking technologies where inks or bit heads have to be replaced regularly. 1, What kind of drawing to be needed for prototype making? We usually use Proe, Solidworks software demolition plans, with Mastercam and Powermill programming, so it is best to turn into a 3D document by stp or igs format. 2, Can we still make prototype without 3D files? In case, client can't provide the 3D files, it is still workbale by CAD (DWG format) or PDF document as a simple parts can be processed in accordance with 2D drawing, Of course, we can create a 3D files for client by reasonable charge depending on your design requirement.